Aquamarine is the birthstone for those lucky enough to be born in March and their choice of Zodiac signs includes both Pisces (February 19 - March 20) and Aries (March 21 - April 29). 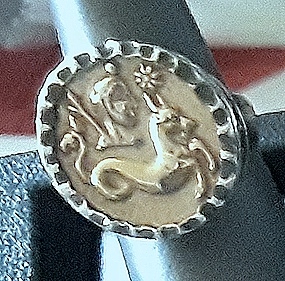 Gold Zodiac rings designed by Rhoma Young. Each ring’s center is all hand cast gold that’s recycled and made from an impression of antique French buttons. The outside is also all hand cast and hammered by an expert goldsmith.